Elegant design that makes a beautiful addition to any kitchen. 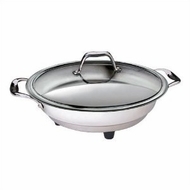 Our electric skillet features a 12 inch non-stick cooking surface with a tempered glass lid. Skillet has a removable temperature probe. Hand washing recommended.